17/09/07 — Acquisitions — Pau, Musée des Beaux-Arts —After the beautiful painting by Simone Cantarini pre-empted in Clermont-Ferrand in 2006, the Musée des Beaux-Arts de Pau has enriched its collection with a purchase from Breton-Blondeau in Paris of a canvas by Giulio Carpioni (ill. 1) representing Liriope presenting Narcissus to Tiresias. Although the subject is unusual, it is often found in the artist’s work, each time with a different composition . The blind prophet Tiresias predicts to Liriope, Narcissus’ mother, that her son will live a long life “if he does not know himself”. The outcome of the story is familiar to everyone : the iconography of Narcissus looking at his reflection until he falls in the water has been treated, unlike the one here, universally. 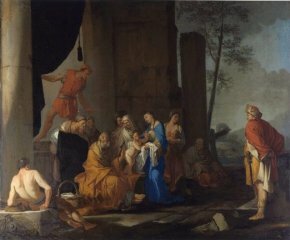 The classical composition reveals Poussin’s influence. Carpioni’s figures have strongly marked facial traits which makes it easy to identify his paintings and which one finds in this work. The other two acquisitions are XIXth C. paintings. The first is a canvas by Achille Devéria (ill. 2), the brother of Eugène of whom the museum owns an important collection. A student of Girodet, Achille is a perfect example of the Romantic illustrator having produced innumerable lithographs and a great many drawings. On the other hand, he painted very little. The subject of this religious scene, which entered the museum with the title : The Entreaty, is not clearly identified. Why is the kneeling woman imploring the monk ? Who is the mother of the child : the implorer or the one holding him in her lap ? There may be a moral to this story, perhaps the child was born out of wedlock . This type of edifying representation was frequent in the XIXth C. and one might compare this painting to those of Octave Tassaert (especially The Abandoned Woman), for example, or in a completely different style, to Good and Evil by Victor Orsel which tells the story of two women one of whom is happy and the other who finds a tragic end for having conceived a child in sin. The second of these acquisitions is by the Belgian painter Gustave Wappers (ill. 3). The subject, the Giaour is taken from a poem by Lord Byron and seems a direct reference to the work of the same name by Ary Scheffer, shown at the Salon in 1833 of which a small version was acquired two years ago by the Musée de la Vie Romantique in Paris. By acquiring these pieces, the Musée des Beaux-Arts de Pau pursues its policy of increasing its holdings with an emphasis on Italian Seicento painting and Romanticism around Devéria. Other examples are the versions in the Musée des Beaux-Arts de Besançon, in Staatliche Kinstammlungen in Kassel or those auctioned at Sotheby’s London April 16, 1980 ; Christie’s London March 19, 1982 or, again, Sotheby’s London December 8, 2004. To our readers if anyone knows the exact subject : please feel free to write in.